An introduction to fluorescent minerals, types of fluorescence, how to find fluorescent minerals, light sources, types of light, and where to collect. 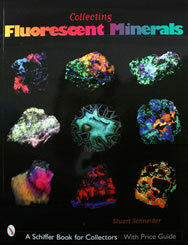 The strength of this book is the over 150 pages of breathtaking photos showing fluorescent minerals under daylight and UV illumination (that's about 1000 photos). You can learn a lot about fluorescent minerals from these detailed photos. Paperback, 8 1/2" x 11", 192 pages.